Is a locavore diet a nutritious choice? Myth 15: Local vegetables and fruits are always more nutritious. Umm… Am I the only one who sees DC’s comment as validation of this myth? Sure, there are lots of factors affecting the nutrient content of foods but the truth is, local food is more likely to be picked near peak-ripeness and arrive shortly thereafter on your plate, so it’s probably going to contain more nutrients than food coming from the other side of the planet. Even if local food may not always be more nutritious than food from elsewhere there are other good reasons to buy locally grown foods. If you shop at a farmers’ market you can ask the farmer questions about your food and how it was grown. You’re also supporting the local economy and keeping these skills alive in your area. Plus, if there ever comes a global economic collapse, it might be handy to have food grown nearby. I’m not saying we all need to strictly adhere to a 100 mile locavore diet (I for one need my coffee!) but if you have the choice between buying a food that was grown locally and a food that was shipped from far away I say go for the local item. 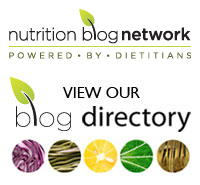 Tags: Dietitians of Canada, local food, Nutrition Month, vegetables and fruit | Permalink. Glad to see you supporting the local food movement – I need my coffee too, but find so many benefits from buying my produce locally.